Like many athletes, Rob Chudzinski just couldn't give up the game when his playing days were over. But fortunately for him, he found the perfect spot to fill the competition void ...as a coach at the very place that put him on the football map...the Greentree Practice Field in Coral Gables. Rob would get his coaching start as a graduate assistant under UMSHoF member Coach Dennis Erickson, and became a full-time coach when Coach Butch Davis took the Hurricanes helm. 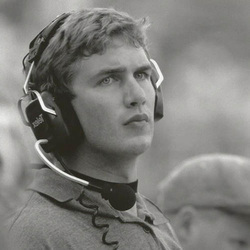 Beginning as tight ends coach (1996-2000) and extending through his time as offensive coordinator (2001-2003) under Coach Larry Coker, Chudzinski parlayed his playing experience and coaching ability into developing outstanding talent, including All-American tight ends UMSHoF member Bubba Franks, along with Jeremy Shockey and Kellen Winslow, Jr.
As a Hurricanes player and tight end standout, “Chud” was a member of two National Championship Teams (1987 and 1989). He caught 71 passes for 7 touchdowns, including an acrobatic 10-yard scoring reception that not only sealed the 1990 Sugar Bowl game and Miami's third National Championship, but got him a 2-page spread in Sports Illustrated. A native of Toledo, Ohio, Rob is a member of Iron Arrow, the highest honor one can attain at the University. He was a three-time (1988-1990) winner of the Mariutto Family Scholar Athlete of the Year Award and was Miami’s first-ever recipient of the NCAA Postgraduate Scholarship for football. He earned a BBA in Business Administration in 1990 and went on to earn his MBA in 1996.